But when we really look at the day to day lives we lead with our partner, is there really a strong sense of trust?Weaknesses in trust can range from intense to more subtle. Perhaps– with no real evidence to indicate it– you worry about your partner cheating on you or maybe you doubt he or she will love you if you let your true self show. It could be that you regularly expect that your love will not follow through on a promised project or task. No matter where on the spectrum lack of trust falls, it gets in the way of your relationship being as intimate as it could be. Imagine you are 50 ft. up in the air on a climbing wall with nothing keeping you from falling except a harness, rope and your climbing partner—or belayer—who stands on the ground holding that rope. From the top of the wall you gaze down at the ground and begin to wonder: How sturdy is this rope that is holding me up? Will my belayer prevent me from falling and get me down safely? Needless to say, vulnerable feelings and just a little bit of fear may come rushing in. It is up to your belayer to pay attention to what you are doing and to adjust the rope accordingly. It is also up to you, the climber, to trust that you will be eased gently down the wall to the ground when you have reached the top. A distracted belayer could mean not only a bumpy ride down the wall, but also your safety in jeopardy. At the same time, an untrusting climber could hang indefinitely on the wall refusing to move. It is literally a leap of faith when you let go of the holds and allow yourself to be lowered down. Climber and belayer must work together, stay present, and communicate clearly so that the climbing experience will be enjoyable and not end up an emergency room visit! So it goes with intimate relationships. It is not uncommon for one or both people to feel vulnerable and wonder whether or not the other person will be there when needed. 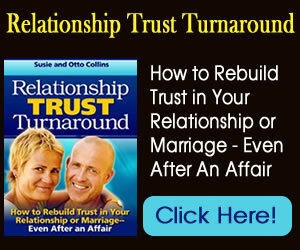 Without trust in one another, intimacy cannot grow and your relationship can become stuck. Try these 3 ways for creating trust and intimacy with your partner…. Almost every one of us has had a past relationship that left us feeling wary of loving or trusting anyone again. Tune into your current situation and allow yourself to move on from those old hurts. This may require acknowledging the ways that the past comes up for you in the present. Breathe and remind yourself to let go of the past and focus on what’s currently going on. Sometimes we hide habits, tendencies, even desires that are important to us because we don’t trust that our partner will approve of them. We undercut intimacy by keeping this barrier up to hide what we think won’t be loved. In effect, we don’t feel lovable as our true selves. Make it a goal to appreciate yourself—“warts” and all—and then allow every part of you to be seen by your partner. Chances are your love will be more accepting than you think. Just as communicating is vital to the climber and belayer, it is also important to anyone wanting to increase intimacy in a love relationship. When situations come up that challenge your trust in the other person, stop and ask him or her questions about what appears to be happening. It is likely that your perceptions are not accurate. Listen with an open heart and allow yourself to understand what is going on for the other person. These 3 ways can help you begin to turn a relationship weak in trust into one where strong trust fosters deeper intimacy. It starts with letting go, loving yourself, and listening with an open heart. Is a Little Jealousy Okay?